Irish mineral exploration firm Connemara Mining has said there is a good prospect of recoverable gold deposits at its licences on the border of counties Wicklow and Wexford, adding that it could start drilling in the coming months. The announcement follows a recent airborne survey of the highly-anticipated gold licences by Connemara’s joint venture partner, Canadian exploration firm, Hendrick Resources. The Canadian company has an option to spend €1m on obtaining a 75% stakeholding. The survey noted a strong north-east/ south-west “magnetic high trend” located along the west of Connemara’s licence block, hinting at a deep-seated structural zone. It also noted “multiple magnetic highs splaying off this zone” — clear indications of a prospective structural setting and typical features in areas associated with gold mineralisation. 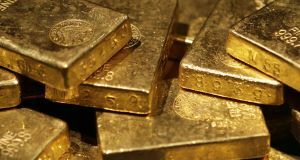 Commenting on the latest news, Connemara’s chairman John Teeling said he was “very pleased” with the results of the survey, adding that the Wicklow/Wexford area has “long held the potential to host commercial gold deposits”. “The airborne survey results highlighting the Tombreen and Knocknalour areas supports our earlier work, but new areas are identified near Carnew and north-east of Clohamon. It is very early days in this exploration, but the results are very encouraging,” he added. Last month, Connemara — which has its shares listed on London’s AIM market — reported a pre-tax loss of €397,121 for 2011; up by nearly €100,000 on the previous 12 months. However, it also delivered an upbeat medium-term outlook and said that it has in place “adequate funds” to cover all proposed expenditure for the current year. Connemara is mainly known as a zinc explorer and has a number of such licences in Meath, Cavan, Limerick and Tipperary. It could begin drilling in Wexford/Wicklow, on its gold prospects, before the end of the year, pending the completion of further geochemical work and mapping to identify targets.